Orchids listed and shown below are some of the most popular and common types grown. Descriptions represent general information. 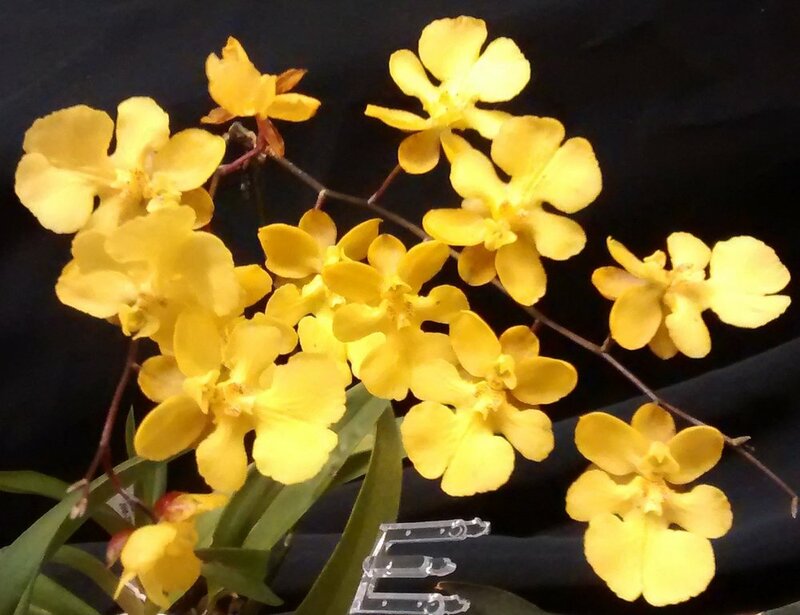 More detailed information about growing, including fertilizing and potting, are available through organizations that promote orchids, their care and cultivation. The American Orchid Society (AOS) provides culture sheets for an extensive number or orchid types (http://www.aos.org/orchids/culture-sheets). Clicking on the highlighted names of the orchids listed below will link to culture sheets provided by the Canadian Orchid Congress. Cattleya - Cattleyas are among the most popular orchids and are often know as "corsage orchids". Cattleyas and their related hybrids come in many colors, shapes, forms and sizes. Culture varies only slightly among most of these. Light is the most important factor in growing and flowering cattleyas. Bright light to some sun should be given to the plants, with no direct sun in the middle of the day. Ideal temperature should be 55 to 60 F at night and 70 to 85 F during the day. Water should be provided in two ways: in the pot by watering and in the air as humidity. Mature cattleyas need to dry out thoroughly before being watered again. Humidity should be 50 to 80 percent for cattleyas. This can be provided in the home by placing the plants on trays of gravel, only partially filled with water so that the plants do not sit in the water. Air should always be moving around the plants to prevent fungal or bacterial disease, especially if high humidity or cool temperatures exist. Miltoniopsis - These striking orchids are also known as pansy orchids, owing to their similarity to garden pansies. Miltoniopsis are cool-growing orchids that originate in the higher elevations of the Andes in Colombia, Panama and Ecuador. The warmer-growing species, properly miltonias, originate from the Minas Gerais area of Brazil and more closely resemble large-flowered oncidiums. Their flowers can be brilliantly patterned. These orchids prefer light shade as direct sunlight can quickly burn the leaves. They need intermediate temperatures throughout the year--not too hot, not too cold. If temperatures are not kept under 80 degrees, they may not bloom. The minimum temperature is 50 to 55 F. Water must be plentiful and the medium must drain perfectly. When they are not getting enough water or humidity, the leaves have a tendency to grow with accordion-like pleats. The warmer-growing miltonias should approach dryness between waterings. Humidity must be at least 70 percent because of the plants' need for abundant water. Less humidity will stress the plants and can lead to susceptibility to disease, though too much humidity is worse than too little. Oncidium - Oncidiums are an extraordinarily large and diverse genus with an equally diverse number of habitats. Oncidiums may originate anywhere from sea level in the tropics to the high elevations of the Andes. This makes cultural generalizations difficult. On a single spike, they typically have multiple flowers the size of a quarter to three inches across, giving the origin of the name "damcing ladies" or "bumblebees". Varieties range in color from yellow to purplish red. Certain varieties (e.g. Shari Baby) smell like chocolate. Light needs can vary from bright to nearly full direct sun depending on the species. Generally, thicker leaved plants, such as "mule-ear" and "equitant" oncidiums, can stand more light. In the home, east, south or west windows are ideal. Temperatures for this group are generally considered intermediate to warm: 55 to 60 F at night, and 80 to 85 F during the day. Water requirements vary with the type of plant. Generally, plants with large fleshy roots or leaves need less-frequent watering than thin-leaved or thin-rooted plants. Watering should be thorough, and the medium should dry at least halfway through the pot before watering again. Plants not actively growing should be watered less; many species have winter rest periods. Many oncidiums require less humidity than other orchids and have requirements that range between 30 and 60 percent. Placing the plants above moist pebbles in trays is ideal. Phalaenopsis - Sometimes referred to as moth orchids, "phals" have large leaves and are adapted to grow in low light. A graceful arc of multiple flowers typically appear on each spike and last for months. Phals are a popular orchid widely available at grocery and home stores and are one of the easiest to grow. Phalaenopsis are ‘low’ light orchids. They grow beautifully in an east window and can be grown in a south or west window if protected by a sheer curtain. A phal’s leaves should be olive green. If they are darker it means the plant is not getting enough light; red tinged leaves mean the plant is getting too much light. Once the plant is in bloom you can place it anywhere in your home out of direct sunlight. If your plant does not re-bloom, increase the amount of light that it receives. They are generally most happy at about 65 to 70 degrees, making them ideal for most Montana homes, but will tolerate as high as 80 degrees during the day. How often you water will depend on the potting medium. Bark retains less water than moss. If your phal is potted in bark, watering once a week is generally sufficient. If your plant is potted in moss, water when the top feels dry. If any water remains in the crown (where the leaves join in the center) use a paper towel to blot the water to avoid crown rot.